Sir, - I wish, with your permission, through the medium of your paper, to call attention to a grievance which I think, in common with some other residents in Havelock Road, I have with the billeting gentlemen of the 4th Lincolns who are at present stopping in the town. On Friday last 2 N.C.O.’s, together with a police constable called at my house and billeted two Territorials, who according to instructions were to arrive at my house about 5 o’clock on Saturday. Naturally, sir, arrangements were made for the reception of the soldiers. Trouble was taken, certain expense was incurred, but up to the present the gentlemen have not arrived, neither has any intimation been received from the billeting authorities that the billets would not be required. Now, sir, I ask, is this fair treatment? We were prepared, as we have done before, to make our visitors welcome and comfortable, and I think (and I am not alone, as some of my neighbours, who have been treated in the same manner, feel just as strongly) we might have been treated with what we have learned to call common courtesy, such as is due from one man to another. But there, sir, I do not know whether a blunder has been made, or whether the position has arisen through an oversight. Looking at the bald facts, however, it seems to me that we have been made fools of. All motors, bicycles, horses, mules, donkeys, carts, carriages and other vehicles, harness, petrol, launches and lighters should be moved to a preconcerted place or as far as practicable from the area of military operations. If they cannot be immediately moved, they must be destroyed or rendered useless. No attempt, except under orders from the military authorities or the police acting under military orders, should be made to burn, cut or destroy any of the following: bridges, railway rolling stock, electric light or power stations, telegraph or telephone wires, wireless stations, waterworks, sluices or locks, piers or jetties, and ferries. Prompt assistance should, however, be given to the military authorities to carry out any of the foregoing operations which they think desirable. All tools, pick-axes, saws, barbed wire, and other equipment required by the military authorities should be placed absolutely at their disposal; and all persons physically fit should be prepared to do any work required of them. It is of the utmost importance that the movements of troops and artillery should not be hampered by the presence of numbers of civilians on the roads. Any persons leaving the district should avoid the roads required by the military forces. These will be as far as possible indicated to them by the police. If advancing troops are met upon the roads, civilians must immediately pass into fields and lanes and leave the roads clear. The civil population should remain quietly at home. They are on no account to be in possession of fire arms. This does not apply to members of recognised Volunteer Corps who will be entitled to the rights of combatants if acting under officers and wearing the fixed distinctive badge. Unless special instructions are give by the military or police, supplies should not be destroyed. The military authorities may, at their discretion, destroy or require the Police to destroy, wholesale stores of provisions, granaries, and flour mills. Retail and private supplies may be left untouched. Any person refusing to destroy or render useless his property when ordered by the military authorities will lose all claim to compensation if it is destroyed or rendered useless by the military or police. The following roads will probably be used by the troops: Bedford – St. Neots – Cambridge; Bedford – Shefford – Hitchin; Bedford – Ampthill – Luton; Bedford – Willington – Sandy; Bedford – Newport [Pagnell] – Stony Stratford; Wellingborough – Irchester – Higham Ferrars – St. Neots; Northampton – Houghton – Yardley Hastings – Bedford. If livestock is ordered to be removed it should be driven in a westerly direction by roads not used by the troops. Wednesday 27th January 1915: Mrs Evelyn Beatrice Chaldecott has sent more news of her sea voyage to India to her mother in Bedford. They had a rough crossing of the Bay of Biscay during which she and her four year old son Gilbert were both sick as the ship “pitched and rolled and then gave horrid corkscrew motions”; mercifully the French governess was fine and looked after both of them and also the little girl in the next cabin whose nurse and grandmother were both ill and whose mother had a small baby to care for. Poor little Gilbert had a pain and whimpered “I wish there was no sea and no boats”. The weather had since improved and they were able to spend time on deck. Except for the early dinner and the shortage of space in the saloon she does not mind being second class on such a luxurious boat. The food is quite good and the cabins are better than first class on the City Line. There is a large fan in their cabin free of charge, which normally cost a guinea extra. On Sunday 10th they stopped at Malta from 8am until 3pm and were all able to go ashore. They drove out to some gardens and saw orange and lemon groves. As she did not want to take Gilbert among the crowds they stayed inside a “horrid little carriage without springs” and found Malta disappointing – “bare and brown and dusty”. As passengers have left the ship there are plenty of empty cabins so Mademoiselle Coller was given a two-berth cabin of her own and she and Gilbert had their cabin to themselves. They received Marconi News each day but no casualty lists. She hopes they “are not very awful”. As the journey progressed Mrs Chaldecott made an “awful discovery”. At first she had thought that the governess was asking for a little brandy each day to ward off seasickness but the woman’s behaviour increasingly aroused her suspicions. After Mademoiselle got her own cabin things “went on more smoothly” until the Wednesday before they landed when her temper and rudeness were intolerable. She discovered from the chief steward that the governess had bought three bottles of brandy, various other drinks, and the stewardess took a bottle of beer to her cabin each night. For final confirmation she took the ship’s doctor to the woman’s cabin. “She knew she was caught and was simply furious, sobbed and cried and said I was very unkind and told all sorts of lies … He said of course she had been drinking heavily and was evidently an old hand and he fancied she took drugs too”. 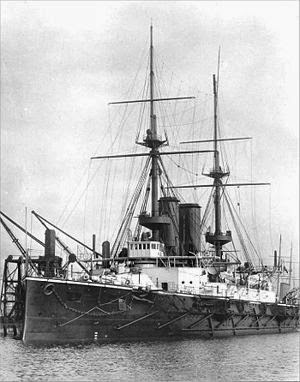 When they arrived at Bombay on 22nd January she was obliged to send Mademoiselle Coller home by the next boat, the Arabia which left the following day. 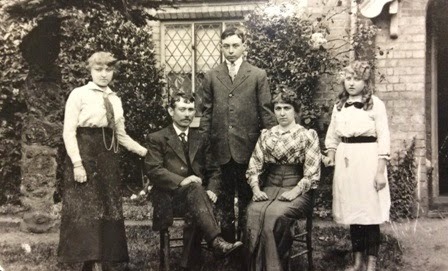 Monday 25th January 1915: Five Belgian refugees are living in a comfortable cottage in Maulden which has been lent and furnished with good antique furniture by Mr W. P. Gordon. They are being maintained by the people of Great Barford and Maulden, and by gifts given by other friends. The two boys have settled happily at Maulden School and are fast learning English. Monsieur Charles Van Huffel, his wife and two boys, aged 10 and 7, come from Ghent and their friend Madame Rombaux from Bruges. Monsieur Van Huffel is the general agent at Bruges for all the French newspapers. He was in the city with his wife and Monsieur and Madame Rombaux, when they heard that the Germans were approaching Ghent. They decided to walk the 27 miles there, collect the boys and bring them to Bruges, but on the journey the Germans arrived at Bruges making it impossible for the men to rejoin their wives. They left Bruges on a crowded train for Ostend, from where they travelled first to Dunkirk, then to Calais, and from there to the refugee centre at Earls Court. After staying at Earls Court for 17 days the men went to Dulwich and Monsieur Van Huffel managed to obtain the passports needed to return to Ghent via Holland to search for his family and Madame Rombaux. He discovered the two women had gone to Bruges where they were bravely trying to carry on his business as newsagent. On the day he found them there three young priests were shot for looking at an enemy aeroplane through binoculars, and a young man for being on the streets after curfew. They went back to Ghent on foot, collected the children from friends who were caring from them and left for England where they found Monsieur Rombaux, a soldier, had left for Belgium to attempt to rejoin the Army. 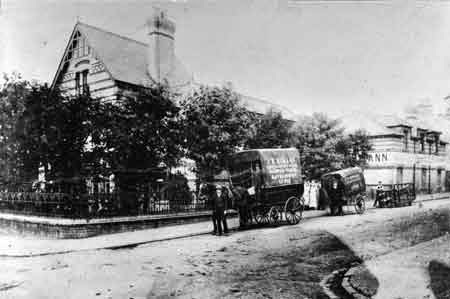 After ten days at Dulwich Baths the refugees left for their new home in Maulden, which they greatly appreciate. A sixth refugee, Monsieur Joseph Schwartz, also came to Maulden but has gone in search of his family as he has not been able to get any news of them. Monsieur Schwarz had a general stores, coal and flour business in the village of Tintigny, where he lived with his wife, their seven children, including twins just eight months old, his own parents and his wife’s parents. He belonged to the Reserve Artillery and was called up on 1st August. A few days later his home, along with almost the entire village, was burnt by the Germans. He was wounded at Aerschot and treated in an Antwerp hospital for a week before he was forced to leave when the Germans entered the city. Friends managed to get him to England three days before the Germans entered Ostend and he was treated at a Military Hospital in Folkestone. After time in Sussex, Dulwich and Maulden Monsieur Schwarz left last week to try to find his family, having been unable to get information from any of the Consuls in Holland, France, Belgium or England. You’ll be surprised to hear that our rest has been cut short and we are in it again. When you’ll receive this I can’t say as I don’t suppose letters will be collected for some time, but today we are resting after two days’ march covering about 25 miles, and we are in roughly the same place as we were before only further on. The village is in ruins. The Church is bullet riddled and almost all the houses also. Again I have bad news to relate – Archie now in hospital with something wrong with his knee. Thus we are two now, but fortunately we have struck luck for once. We are in a mineral house in a room on the second floor in which are three bedsteads with spring mattresses. We have blocked up the windows and are more or less comfortable. It’s a great luxury to have a bed, you can guess. We left at about 3.30 on the 14th and marched until ten that night, and it was just my luck to receive your parcel about half an hour before. We ate some – the cakes and sweets – and I strung the rest at the back of my pack. After marching for about an hour this fell off and I struggled on for about another mile and we passed through a town. I was almost dead and feeling queer, scarcely able to drag one foot after another, so seeing another kiltie by the side of the road I gave the packing to him as I couldn’t carry it longer. You can guess what I must have felt like giving away the sweetmeat I’d wanted so much but I was feeling too awful for words. At the rest halt I reported myself sick to our officer who carried my rifle for me and got permission for my pack and equipment to go on a gun carriage, so I followed on but kept up and arrived all right, slept all night without waking. In the morning I felt better and did the rest of the march in full marching order. By jove, to say ‘the fair fields of France.’ That’s a bit thick! I should like you to see this village – its awful. Mud in its prime condition, I can assure you. Lance Corporal Brazier of the 2nd Division of the Oxon and Bucks Light Infantry has written home to 30 Wing Road, Linslade, to say he has now been in France for five months and is still happy and in the best of health. 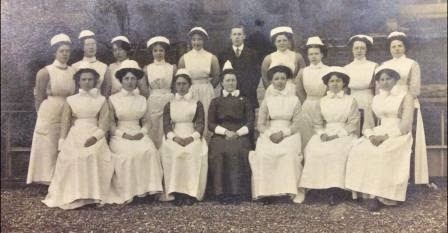 Saturday 23rd January 1915: The Hospital Committee of Ampthill Rural District Council has reported on the question of admitting fever cases from Ampthill training camp to the Isolation Hospital. It has recommended that the Clerk of the Council should write to Colonel Murray stating that the Council would be prepared to accept scarlet fever cases from the camp at a charge of £2 2s per week per patient. This would be subject to there being room at the Hospital, and with Dr Garner having sole control over the number of cases to be admitted. 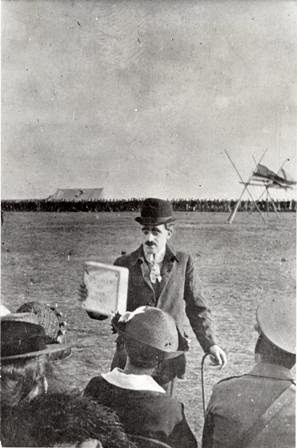 Colonel Murray has assured the Committee that the military authorities would be willing to pay liberally for this service. There are currently eight patients in the Isolation Hospital suffering from scarlet fever and while there are no cases at the camp at present it is realised that this is a possibility and the Council wishes to assist the War Office in any way it can. However, the offer would not be open to any other troops quartered in the Council’s District. In view of this the Medical Officer asked what would happen in the case of a man from Marston Moretaine who enlisted and was billeted at Haynes. Would he then be eligible for the Hospital? 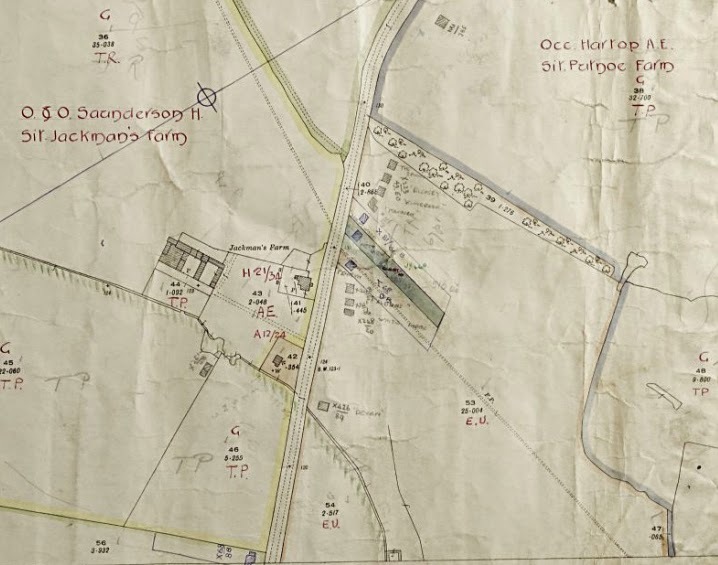 The Chairman of the Council agreed that he would, but said that the Council would not be obliged to accept any other soldiers whose homes were outside the District. 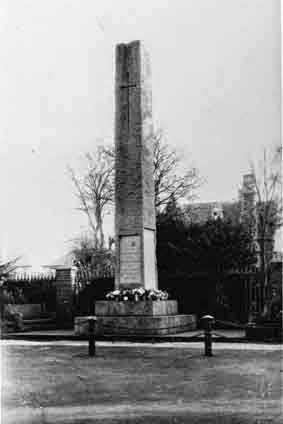 Friday 22nd January 1915: Corporal William Rooney of the 12th West Yorkshire Regiment has appeared in Court charged with assaulting Police Sergeant Dennis while in the execution of his duty at Leighton Buzzard on 10th January. PS Dennis was in Church Street near the Stag’s Head Inn when he heard a disturbance near North Square. When he got to North Street he saw Corporal Rooney and two privates; they were using filthy language. He asked them to stop but they took no notice. When asked a second time PS Dennis took hold of one of them and told him to get home to his billet. Corporal Rooney told him to let them alone as they were under his charge and caught hold of the policeman’s arm. PS Dennis told the corporal not to interfere with him while he was in the execution of his duty and again took hold of one of the men, warning that he would fetch the guard if he did not go home. Corporal Rooney then struck PS Dennis a violent blow to the mouth, which cut his lip and made his nose bleed. The policeman caught hold of Rooney as he fell and pulled him to the ground, where they struggled. Rooney broke away and ran down the road. When PS Dennis tried to follow, the other two soldiers obstructed him. The three men then ran down Chapel Path. PC Keens came up and they rushed at the prisoner but he slipped past. PS Dennis shouted for the guard, who came out and stopped him. When questioned by Lieutenant Morris, an officer in Corporal Rooney’s company, PS Dennis agreed that to push a man might get his back up, but denied kicking one of the men in the scuffle or kicking the prisoner while he was on the ground. Corporal Rooney stated in Court that he was walking quietly down Church Street with two others but they happened to be in front of some other soldiers who were making a noise. The police sergeant came up to him and told him to clear off and he replied that he had done nothing. PS Dennis then struck at him; he put up his elbow which accidentally caught the policeman in the face. They fell to the ground together where PS Dennis kicked at him twice and tried to throw one of the privates on his back. The three of them ran away. Later they were walking down Church Street when they met PS Dennis again, who rushed at him but was not able to get him. He said he ran away from Dennis to avoid being caught by the guard for being out late. 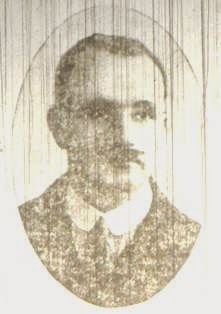 Private George Smith, who was with Corporal Rooney, corroborated his evidence, although he did admit saying in the guard room that the Rooney had assaulted the policeman. Private Joseph Linnett gave further corroborative evidence, adding that PS Dennis pushed them first and kicked both Private Smith and himself in the back after they said they were going home. Sergeant Harold Brooks said he had known Corporal Rooney since September 9th and found him one of the most good natured men in the Regiment. Corporal Alfred Wilson, who was on guard on the night of the alleged assault said he had followed PS Dennis up Church Street and saw the Corporal on his knees in the road. PS Dennis tried to kick Rooney and did not call on him for assistance. Lieutenant Morris gave Corporal Rooney an excellent character and said it seemed perfectly clear from the evidence that the bother arose out of “an excess of zeal and a little misunderstanding”. While not making any accusation against the policeman he did point out that it was natural if a man was pushed for him to push back. He also stated that PS Dennis had no right to touch Corporal Rooney as he was doing nothing wrong and the matter was outside the scope of his duties. The military authorities regretted the incident, but asked that the Corporal be released without anything against him. After considering the matter the magistrates dismissed the case, which appeared to them to be trivial. They expressed the hope that the previous good feeling between the military and the police would continue and that there would not be similar cases in future. Though we have often had a rough time, both of us are still game. We hear that you have had floods in England but, according to the papers, our rainfall has been about four times as great as that in England. Still, despite a very muddy and wet time, we are endeavouring, not without success, to keep up the reputation for cheerfulness which the British soldier has earned. Robinson was enjoying a very well earned rest for a few hours, and had gone into an estaminet, or eating-house, to get a snack when Anderson’s head appeared in the doorway. Though Robinson had not seen him for years he immediately recognised an old pal and shouted out, “This isn’t Luton, not nearly so quiet and respectable” and they were soon chatting over old times, of how well Luton have played this year, of their hard lines in the Cup fight, and of how next year, or later on this year, when the English Army has entered Berlin, the boys of Luton, those who could not come out here, will bring the Cup to Luton. We hope, however, that by that time some of us who have not shirked our duty will be back to help them – having scored many times against the Germans. Hoping that all at Luton are as well as possible in this very trying weather. We are proud to be natives of a town which has been so very loyal and has sent so many of her citizens to answer the call of their country. Rifleman Anderson survived the war. His medal card shows that he served in the Rifle Brigade, the Labour Corps and the Royal Army Service Corps. Unfortunately it does not give a first name which would make it possible to identify him. I cannot just now possibly produce vouchers for everything as the statement of accounts are drawn from approximately 300 special constables residing all over the shire. I do not suppose for one moment that a large majority of the special constables can produce any vouchers for the smaller amounts which I should have thought could have been taken as being correct. In regard to my own amounts, naturally I can produce a signed statement but not necessarily vouchers shewing how these accounts are made up. The small items which you criticise, such as 3/- and 2/-, may appear absurd, but they are for men only drawing about 16/- to 20/- per week, and therefore every penny is of consequence to them. The claims sent in are only out-of-pocket expenses and do not by any means represent the cost which has been incurred by individuals. As a matter of fact it has cost a good deal more than the total sum sent in. Seeing that the Government are allowing expenses for the Emergency work I should have thought that these expenses could have been allowed for as well. I would add however that if it can be shewn that there are any other counties in the Country where a force of Special Constables have been raised for patrolling and guarding hundreds of miles of road and wires throughout the shire (the nature of which work has made the out-of-pocket expenses such an important item) and they have not asked for expenses, then I think there would be no justification for the Standing Joint Committee to grant us a sum. It is of no use comparing this account with any expenses that may have been incurred by Special Constables for Town duty as these naturally have no expenses at all. I herein return you the account. Unfortunately there is no further correspondence to indicate whether or not the expense claim was eventually paid. 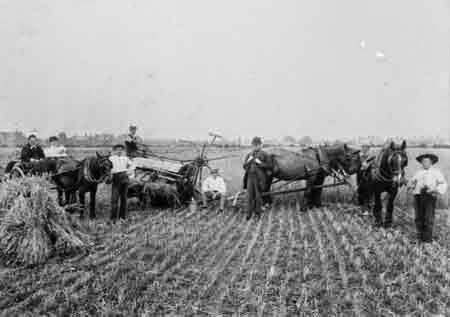 Monday 18th January 1915: Last October the Education Sub-Committee of Bedfordshire County Council ignored representations from those involved in agriculture requesting that they permit the employment of boys aged 12 and over to held make up for the farm labour shortages caused by the war. Instructions were issued to School Attendance Officers that they must report such cases of non-attendance to the Director of Education. It appears the Sub-Committee has now changed its mind. 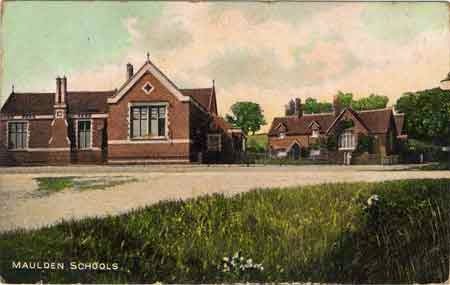 Mr. J. C. H. Robinson of Bedford wrote to Mr. Howard Whitbread in December recommending that the attendance rules for boys whose parents wished them to go to work at an earlier age should be relaxed. The matter was considered by the Elementary Sub-Committee on January 11th and instructions have been given that the school attendance bye-laws should no longer be enforced in those cases where boys over 12 years of age are employed in agricultural work. It is understood that the Board of Education does not wish to interfere with the powers of Local Education Authorities and is leaving these decisions in local hands. Private C. Mackenzie says: “We enjoyed your welcome gifts very much. We are having very bad weather here. Our guns are fairly going at them now, and just shaking the ground under us. All the boys are in good health; excuse bad writing, as writing desks are scarce here – not like good old Bedford, where one could have all comforts, but we came here to rough it, and rough it we must. I received a parcel from your sister, Miss May, for which I do not know how to express my thanks”. Saturday 16th January 1915: Three Sandy men have returned from London with twenty five Belgian refugees and Mr F. W. Western has described their day. The three went first to Aldwych where they were given papers authorising them to choose their refugees at Earls Court. There they found the Great Exhibition venue transformed. Over 2,000 Belgians waited in the great Central Hall, a “seething mass of gallant but unhappy mankind”. The nearby crèche contained hundreds of little beds and wicker cradles. Sandy had made four houses available and the aim was to select nineteen individuals to fill them. Six children attracted their interest but they turned out to be part of a family of ten which would not be separated – a mother with eight children, one married and with a small child of her own. After some debate as to whether they could be accommodated they agreed to accept the entire family who were sent to be labelled for their journey to Sandy. A crowd of refugees then encircled the visitors from Sandy. A swollen-eyed mother with two sweet little girls was recommended to them as the wife of a Belgian soldier. He was now recovering in hospital at Market Drayton from wounds received at Liege and would be able to return to his family once his wife found a home. They agreed to take her and to wire for her husband, a decision she greeted with tears of joy. The woman and children were quickly ready and labelled, for they had only the clothes they stood up in. Next the Sandy men witnessed a commotion which proved to be a group of 200 young Belgians marching off to join the army. They were told that this happens on a daily basis, as young men arrive at Earls Court, register themselves and immediately sign up at the adjacent Recruiting Bureau. 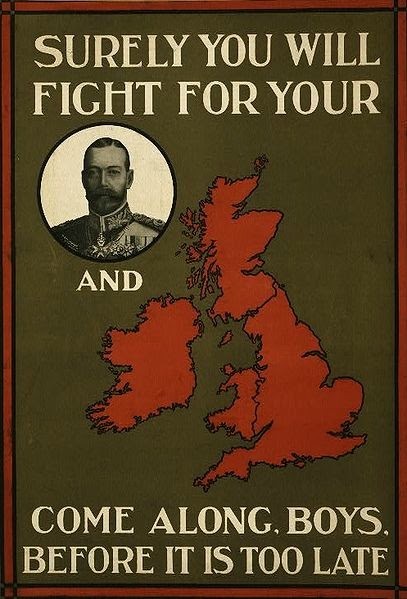 Any “Bedfordshire growlers” who refuse to give money to help the Belgians, complaining that they are sponging on English generosity when they should be fighting should be ashamed! It took a longer to select a third family, but the men finally settled on a telegraphist from Brussels with an “Unfit for Army” certificate who speaks Flemish, French and a little English, his wife, mother-in-law and three little children. The family are destitute and their home destroyed. After a peek at the babies and seeing many others they would have liked to help they chose for their final family a man with his wife, a son and teenage daughters. The man is unfit for military service as he has lost the use of one eye and had worked for a merchant in Brussels for nineteen years. This would appear to be the family shown in the illustration above. Friday 15th January 1915: Private Harry Gray, the son of Mr Walter Gray of 2 Beech Road, Luton, was buried at Luton today. He died in Edinburgh Military Hospital on Sunday from a bullet wound to the head received while serving with the 2nd Battalion of the Bedfordshire Regiment on 18th October, having born the sufferings of the past three months with heroic fortitude. The house surgeon at Deaconess Hospital, Edinburgh described Private Gray as “just splendid”. He had undergone three operations while at the hospital, for all of which he declined the use of anaesthetics. He appeared to be recovering and was sent to a convalescent home, but grave symptoms developed and he was sent back to hospital. His mother and sister were present when he died. The 23rd Battalion of the County of London Regiment provided full military honours for Private Gray’s funeral, with a firing party, trumpeters, and bearers. Two hundred members of the battalion marched in the procession. They were accompanied by the band of the 5th Battalion of the Lincolnshire Regiment. Unfortunately it was not possible to find a gun-carriage to convey the coffin. 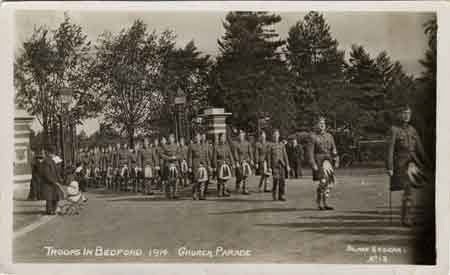 The procession, with the band playing the Dead March, left Beech Road just before three o’clock. A large crowd gathered and lined the route through the centre of town. At the military headquarters the guard turned out with fixed bayonets. As the coffin was lowered into the earth three volleys were fired over the grave and the firing party stood with fixed bayonets while the Last Post was sounded. Private Gray had served with the Royal Garrison Artillery for 12 years, spending almost the entire period on foreign service. About 12 months ago his period of service expired and he was attached to the 1st Beds Special Reserve. He was called up on August 8th and in mid-September fought in the retreat towards Paris. On October 17th his rifle was smashed in his hands by a German shell but he was unhurt. The next day he received his fatal wound. 18th October was the day on which the 2nd Bedfords suffered their first casualties of the war while advancing on the village of Geluwe. The newspaper first gives the date Private Gray was wounded as 17th October but later makes it apparent it was on the 18th. The Girls’ Friendly Society of Colmworth has sent its first parcel of knitted comforts and garments to the Red Cross Society and is about to despatch a parcel of knitted scarves and other items for the crew of Submarine B 11. Another parcel from the parish has been sent to the Red Cross Society. On 13th December 1914 HMS B11 sank the Ottoman battleship Mesudiye in the Dardanelles, an action for which its commander Lieutenant Norman Douglas Holbrook won the Victoria Cross. First Lieutenant Sydney Winn received the Distinguished Service Order and every other member of the crew was awarded the Distinguished Service Medal. Thanks to the generosity of those who have subscribed to the Comforts Fund the Committee has also been able to proved the Bedfordshire Regiments with 1893 pairs of socks, 1321 pairs of mittens, 914 scarves, 535 body belts, 453 shirts, 50 housewives , 88 sleeping helmets, 24 pairs of kneecaps, 12 cardigans, 8 chest protectors, 4 thermos flasks, 31000 cigarettes, 6 gross of matches, toothbrushes, writing paper, peppermints, acid drops, tinder lighters, letter wallets, braces, boracic ointment and cold cream. The packages also included a pot of Vaseline and a cake of chocolate. 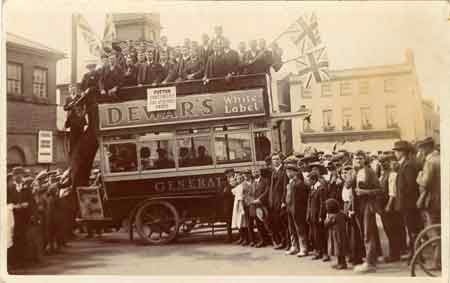 Tuesday 12th January 1915: A batch of new recruits for the 63rd Brigade have arrived at Leighton Buzzard from Lincoln. To free up billets in the town for the new arrivals 362 men who are already well advanced in their training have been moved out to the villages of Stanbridge, Tilsworth and Eggington. 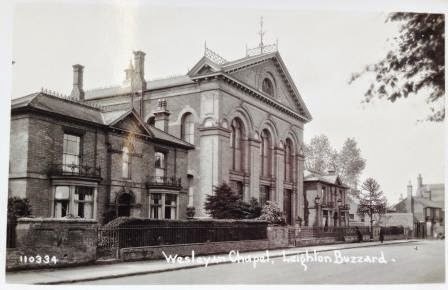 The Wesleyan Schoolroom in Hockliffe Street is being used by the troops for various purposes. 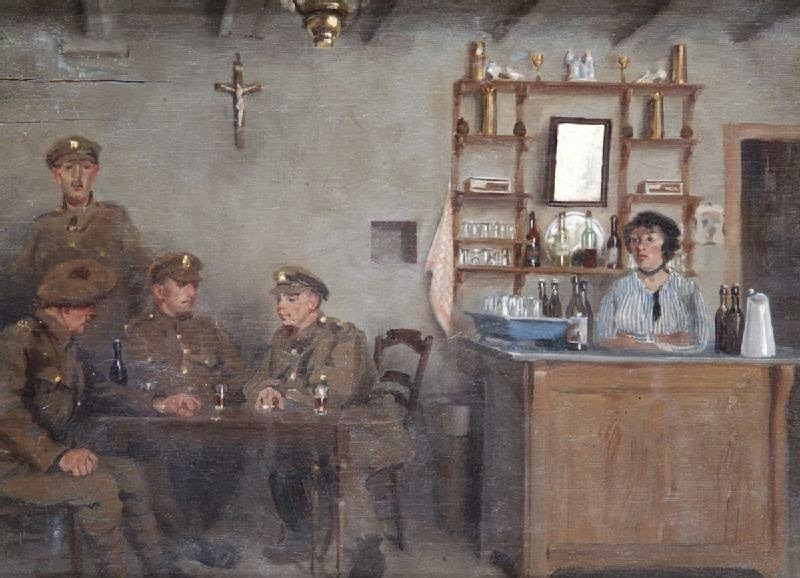 On Sunday evenings a regular social hour is held there which is attended by a large number of soldiers. The bandsmen of the West Yorkshire Regiment practise in the Schoolroom and since last Friday it has also become the paymaster’s office. Thanks to a spell of wet weather it is even being used by the Somerset Regiment for drilling and signalling. On Sunday the services at the Wesleyan Church were conducted by the Wesleyan Chaplain to the 21st Division, Rev. G. H. Crossland, who is stationed at Aylesbury. Across the road in the Hockliffe Street Baptist School Hall concerts were given for the soldiers on Wednesday and Thursday evenings. Wednesday’s entertainment had a popular theme while Thursday’s concert by the Church choir was more classical. The highlights were a solo with instrumental effects titled “The Bassoon” performed by Mr H. O. Kitchener, and renditions of “Your King and Country want you”, “You are my baby” and “On the Mississipi” by Miss Dulcie Griffin. 10th Battalion York and Lancaster Regiment. The Brigade arrived in France in September and first saw action at the Battle of Loos at the end of that month. “I have been wounded and am in a German Hospital. I was hit in the thigh on October 30th and am getting better. You will see by the address that I am a prisoner of war. I should like all in Potton to see how we are treated by our own ambulance men, it will show you what they are. I hope the choir are getting on well and all at home”. Lance-Corporal J. Manning of the 8th Battalion Queen’s Own Royal West Kent Regiment, son of Mrs E. Winters of The Orchard, Mill Road, Potton, was killed on 27th May 1917 aged 28 and is buried at the Railway Dugouts Burial Ground (Transport Farm) at Ieper in Belgium.